Beautifully engraved specimen certificate from Pillsbury Mills, Inc dated 1952. This historic document was printed by Columbian Bank Note Company and has an ornate border around it with a vignette of an allegorical woman sitting in front a farm and processing mill in the background. This item has the signature of the Company's President and is over 54 years old. Flour mills began to be established in the town of Minneapolis in the mid-1850s. Powered by St. Anthony Falls, the mills were supplied with rapidly increasing crops of wheat grown by new settlers in western and southern Minnesota and the Dakotas. Railroads began linking Minneapolis to the west in the late 1860s. The number of Minneapolis flour mills grew rapidly. A few things kept the Minneapolis mills from competing successfully with flour mills in other parts of the country, however. When flour was made from the hard spring wheat of the Northern Plains using conventional milling techniques, it was discolored and speckled with particles of husk or bran, and it did not keep well. In addition, conventional mill stones destroyed much of the most nutritious part of the wheat kernel. In the 1860s and 1870s, the millers solved these problems. They developed a process that made it possible to separate the nourishing "middlings" layer of the wheat kernel, process it, and return it to the flour. A second innovation replaced conventional millstones with large chilled porcelain or iron rollers that ran at a lower speed. This prevented discoloration due to heat and minimized the crushed husk and bran that speckled the flour. By the late 1870s Minneapolis flour was recognized as the best in the nation, and it quickly replaced winter-wheat flour in both national and international markets. The mills located on the west bank of the Mississippi made that area the nation's leading flour center. The Pillsbury Company completed its gigantic A Mill on the east side of the river in 1880. Containing two identical units, it had a capacity of 4000 barrels of flour a day when it opened. By 1905 the mill had tripled its output. Its owners claimed that it was the largest flour mill in the world. Over the years numerous buildings were added to the complex, including a grain storage elevator built in 1910 and linked to the mill by conveyors, another elevator and annex built between 1914 and 1916, and a cleaning house and nine-story warehouse built in 1917. The Pillsbury A Mill is the only mill still operating in the St. Anthony Falls milling district. Tremendous consolidation took place within the flour industry between 1880 and 1900, as numerous mergers occurred. In 1876, 17 firms operated 20 mills; in 1890, four large corporations produced almost all of the flour made in Minnesota. By the early 1900s, three corporations based in Minneapolis controlled 97 percent of the nation's flour production. They were Washburn-Crosby Company, which became General Mills; Pillsbury-Washburn Flour Mills Company, which became Pillsbury Flour Mills Company; and Northwestern Consolidated Milling Company, which became the Standard Milling Company. This Minneapolis "Flour Trust" dominated the national flour market until the 1930s. In 1872 the company reorganized as the C.A. Pillsbury & Co. During the 1880s Pillsbury added six more mills, including the largest in the world. 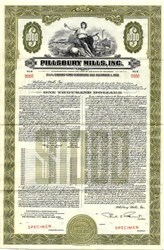 In 1889 he sold the Pillsbury mills to an English financial syndicate. He remained as managing director for the company, now called Pillsbury-Washburn Flour Mills. In 1907 the company was reorganized as the Pillsbury Flour Mills Company. By 1932 the company had begun expanding into specialized grain products including cake flour and cereals. In 1944 the company changed its name to Pillsbury Mills.